Hey guys! Long time no talk. I’m back from Montréal and back at work…I was planning on being back earlier but I got sidelined when I had my wisdom teeth taken out. I promptly developed dry sockets and was put on synthetic morphine for a week. Needless to say, working would have been more than a little difficult at that point. Anyway, what’s new at cafca? A lot of things, actually. First, for the coffee geeks: we got new burrs and a new adjustment ring for our Anfims, and new precision filter baskets for the Synesso. It amazes me how changes like these affect the coffee we serve! Next up: the art frontier. Our current exhibit is from a very talented young artist named Dylan Humphreys. It’s got a very urban and improvised feel to it – I like it a lot. It’s one of my favourite exhibits we’ve had so far. Drop by and see the space; it looks incredible! And that’s a quick summary of what’s been going on lately. We’ve got some really cool live music and even a “rockumentary” lined up for later this summer, so stay tuned! Shohreh Ghanbary is an artist, a woman and an activist whose artistic practice, spanning nearly 30 years is interwoven with and interrupted by experiences of imprisonment, flight, motherhood and the demands of everyday life. It is a practice that arose first from the unsightly guts of a crushed late 20th Century counter-revolution and has continued in exile. Ranging from painting an…d drawing to embroidery and video, Shohreh uses whatever medium is at hand to process and convey. In the very early 1980s, in the wake of an Islamic Revolution, a wave of discontent overwhelmed Iran’s youth. Women who had come to enjoy a significant degree of equality were suddenly viewed by the state as worth no more than 50% of a man. The mouths of men and women who had embraced a revolutionary moment rich with political debate and religious freedom were suddenly forced shut with the reliable threat of prison, torture and/or execution. At the time Shohreh was a young student at the National University of Iran and along with many of her friends she was unwilling to tolerate the extremes of the Islamic Revolution and took to the streets. Her subsequent arrest was nothing more than a factor of probabilities. Locked in Tehran’s notorious Evin Prison for nearly 7 years she was subjected to horrendous conditions, the constant threat of execution and the steady disappearance of fellow prisoners. The imprisoner’s intent, certainly, was to crush her cultural urges and force her to convert and conform. Shohreh had none of that. And despite the least tolerable circumstances imaginable she not only refused forceful conversion, but also found place for beauty and love. In the middle of the night when all was quiet, alone in the bed of her cell with a single needle and gathered threads she would embroider images of hope, commemoration and normality to the inside of the pockets of her chador. And each year as her parents were permitted to bring a change of clothes, her messages of hope were smuggled out. Finally in late 1988, at the time of a brutal five month long mass execution of political prisoners, Shohreh was released. Her survival nothing more than a factor of probabilities. Shortly thereafter she escaped Iran with her prison treasures in hand. And, after 10 years in Montreal she finally settled here in North Vancouver. But like many in the lower mainland who have never really left the freedom crying souls of their youth Shohreh continues to cry for freedom. In addition to attending to the demands of everyday life she works tirelessly as an activist with the Neda for Freedom Society, a North Shore based human rights organization, and continues to produce art works that, exiled from a counter-revolutionary struggle, cry for freedom, reflect on exile and imprisonment and from time-to-time celebrate beauty. Her works are special. They emerge out of unique experience and are not coloured by formal training or excessive theory. Reflecting on Shohreh’s pocket embroideries I often think of the Koreans of the March 1st movement of 1919, non-violent heroes who struggled for freedom and dignity but were brutally repressed by Japan’s Imperial regime. I wish I could give some meaningful reference to artwork that emerged from the prisoners of that moment. But I haven’t done the research and know of no one who has. I imagine however, contortions of the imprisoned soul in spring, through un-air-conditioned summers and under-heated winters writhing with hope and loss crafting, like Shohreh, something of their dreams and fading friends. But there may be reference for Shohreh’s work in more recent times. Because of her prominence, Shirin Neshat’s name often comes up, when speaking about Shohreh’s work. But Neshat was a privileged Iranian woman who left Iran for art school before things got nasty in 1979. A woman who, after gaining a minor foothold in the New York art system, traveled to Iran for a short stint in 1990, returning to the US to comfortably craft reactions that spoke in a language amenable to a scene she was becoming a part of. Shohreh’s work doesn’t rest so comfortably in the milieu of Neshat. 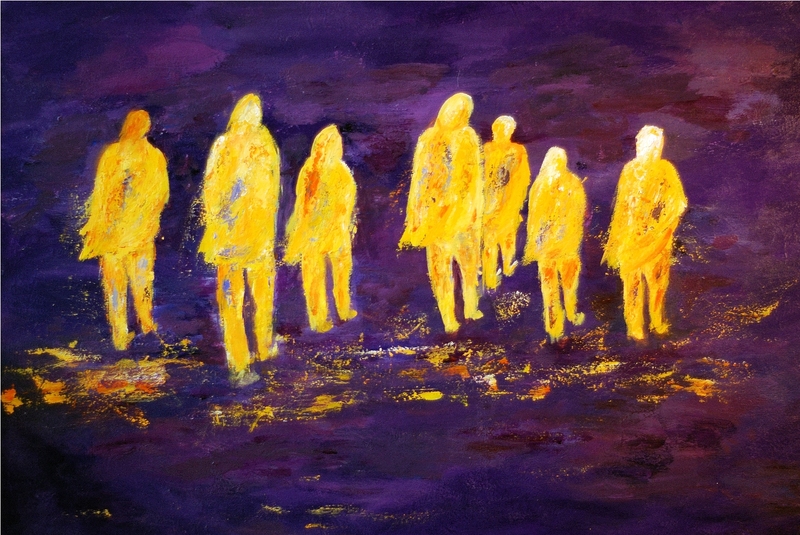 Rather, in terms of a relationship to internationally recognised art, Shohreh’s practice probably finds its most profound kinship or friendship with that of artists like Parastou Forouhar a fellow Persian woman whose intimate experience with the oppression of Iranian regime has resulted in exile, ongoing activism and persistent artistic production. Forouhar’s parents, prominent critics of the Iranian Regime spoke out for human rights and were consequently massacred in the intimate setting of their private residence. Forouhar’s work which grapples with political violence and the position of women in contemporary Iran is, sadly, probably more of a sister to Shohreh’s work. One can only hope that, as the urges of a new generation erupt across the Middle East and a rugged muzzle remains on the democratic movements in Iran, the works of these women find no more kin. Today, at the café for contemporary art it is an absolute honour to have these priceless works on display and as a precious democratic election looms, it is a profound privilege to be able to reflect on these works so generously presented in Shohreh Ghanbary’s solo exhibition/mini-retrospective: counter-revolution, inside-out. 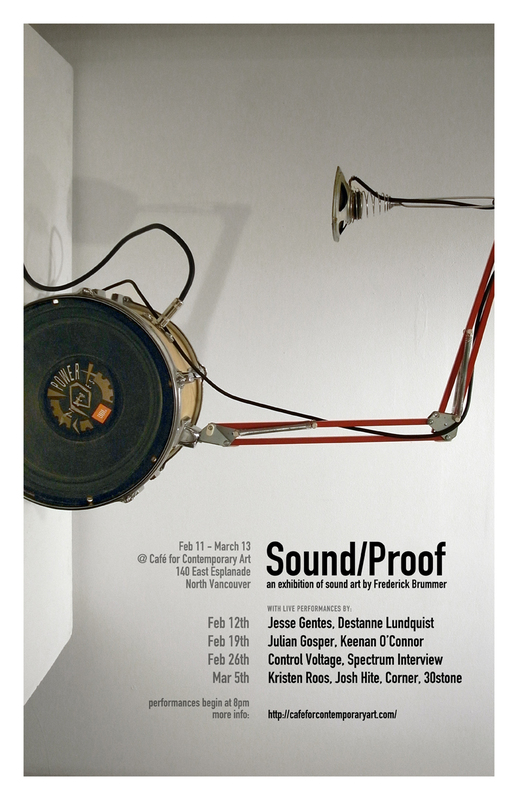 Café for Contemporary Art is proud to welcome “Sound/Proof: an exhibition of sound art by Frederick Brummer” to our main gallery. Frederick Brummer makes one-of-a-kind sound machines. Playfully combining musical instruments, sensors and effects devices with everyday objects he offers a tactile, analogue, experiential approach to electronic music. With a down tone aesthetic that may be considered somewhat Canadian (in a wool sweater, pastiche kind of way), the objects themselves combine various electronics with materials that are often second-hand or well used, making for approachable, comfortable space-mates with unique abilities. The artist himself is deferential, polite, not wishing to impose, but at the same time, a witty, playful perfectionist who is willing to experiment and make some noise; a fun guy to hang out with who you wouldn’t be shy about bringing over to your grandma’s house. And this is clearly understood when experiencing his art. Brummer grew up in a material environment full of guitars, four-tracks, distortion pedals and kind creative music making people. He was later altered through the influence of a seven years long experience in Japan where along with various differences in social norms, due to spatial and material constraints all he had room to create musically was digital. In large part, we have these constraints to thank for invigorating him, upon his return to Canada, to create an extensive series of hybrid, interactive sound sculptures that meld the digital with the analogue, the rustic with the electronic and return music making to a tactile experience of the body. A relatively young artist, musician, interactivity designer and co-organiser of Vancouver’s premier electronic music festival, Square Waves, Brummer has exhibited at various venues including W2, The Vancouver Art Gallery, The Surrey Art Gallery and Telus World of Science. Meanwhile his music has taken him up and down the West Coast of North America and throughout Asia and Europe. His is an exciting practice and hopefully this exhibition will help to bring further attention to his work and help propel him on his way. After 3 years of filming, young filmmaker Mark O’Krafka exhibits an intimate portrait of Mount Currie musician and storyteller Tip-Ta. Originally from Ontario Mark O’Krafka had the childhood dream of moving out the backcountry of British Columbia and living off the land. Now, having lived up and down the West Coast for the past eight years, Mark, currently attends the Vancouver Film School’s Writing for Film and Television Program, where he pursues his interest in people and the intersection of humanity and the natural environment. For this exhibition at the café for contemporary art he presents the first installment of an ongoing film project portraying the life, stories and music of Mt. Currie bluesman, Tip-Ta. In Tips Blues we get our first introduction to this modern-day minstrel who fulfills Mark’s boyhood dream: to move into the backcountry and live off of the land. Along the way we learn about far more than just the forest and trees, but through Tips’ quasi-monastic quest to inspire a betterment of inter-human and man-nature relationships, he teaches us about the mechanics of a culture’s melding with its ever-changing surroundings and struggle to persevere in the face of immense loss and adversity. Tips or Tip-Ta is a seventy one year old elder of the Lil’wat First Nation, who after a long stint of city living decided to return to the land, and began living on a property just outside of the Mt. Currie Reserve; a property he inherited from his grandfather. One of the few remaining people in the world who speaks the Lower Lil’wat sub-dialect of the predominant language of the Interior Salish Peoples, St’at’imc, Tips often travels between the reserve and the communities of Pemberton and Whistler performing his unique form of blues. A work-in-progress, this exhibition begins on November 6th with the installation of part one of the film where we are introduced to Tips and his world. This will be on loop in the gallery until the following Friday when at 7pm, the public will be invited to enjoy Tips’ Blues as he makes a rare journey to the city to play a concert for the people of North Vancouver. From the following day the footage recorded at the live show and accompanying reception will be integrated into the film and this extended version will play for the duration of the exhibition. Come join us for what will surely be an unforgettable experience. This exhibition is up for just a few more days. Comes down on October 14. Catch it while you can! 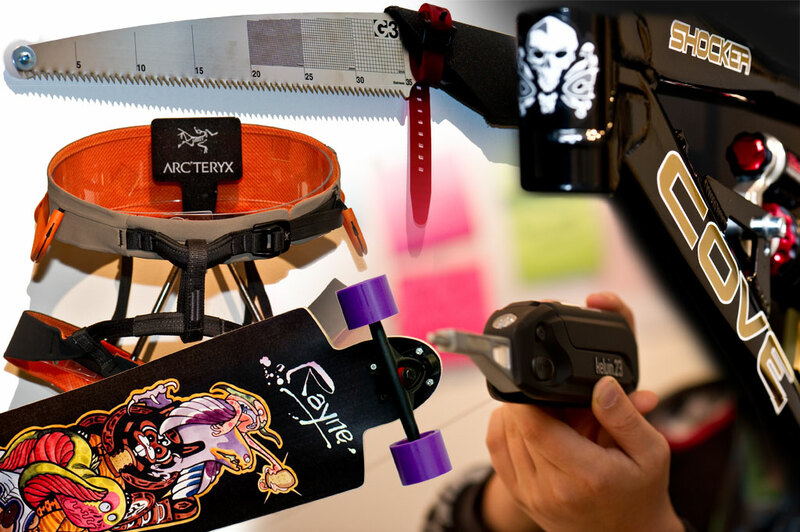 An industrial design exhibition curated by Adrian Boston, ID in NV: Industrial Design in North Vancouver celebrates recent, innovative work by five North Vancouver firms Arc’teryx, Cove Bikes, Kelvin.23, Bull Monkey/G3 and Rayne Longboards. While offering a platform for the acknowledgment of interesting stuff going on in our midst the exhibition implicitly gives rise to questions about how communities negotiate living identities in the context of constantly emerging material culture. Does the North Vancouver Museum and Archives own a Cove Bikes SHOCKER DH prototype? Or an early model Kelvin.23? Or any recently, locally designed objects of the North Shore? If so, how effectively are they empowered to make the local community aware of such a fact? The current exhibition at the Café for Contemporary Art, ID in NV: Industrial Design in North Vancouver, curated by Adrian Boston, features and celebrates a selection of objects recently designed on the North Shore. The exhibition provokes and facilitates an ongoing conversation about how we go about constituting and negotiating our collective memory. One of the central questions apparent in the exhibition surrounds the relationship between design and place. Ours is an increasingly virtual world that, on the surface seems to have lost its need for a notion of place. However, some local designers, while finding markets both at home and abroad, are designing specifically out of their experiences of this place. Considering these objects, this exhibition has us looking for answers to questions our community needs to ask itself; What do these objects mean about who we are? How do they reflect our current needs as a culture? Are we even a we? And how do these objects feature in the idea of that we? Is there actually ID in NV? And if there is, is it something to be NV’d, shared, questioned or what. With the recent development of condos, a hotel and more to come in the Eastern Quarter of Lower Lonsdale, a great though long decayed monument to a particular aspect of local history, shipbuilding, has been lost. We are now left, with more than simply the task of completing the site’s redevelopment. We face huge questions around how this ever changing community (especially as its demographic shifts with an increasing wave of new residents from near and far) will go about giving form to collective memory while leaving space for present and future developments in the notion of who we are. What can we bring together and celebrate collectively? How can different aspects of the community come together to learn about how one another’s local presence came to be and what contributions they might have to offer? Under what frameworks can old and new relationships be negotiated and allowed to prosper? What is our place in an increasingly global and virtual world? Culminating in this current exhibition, over the past year and a half the Café for Contemporary Art has been very seriously engaged with these sorts of questions. Our second exhibition The Sinixt Don’t Make Totem Poles Either: Public, Art, Memory, set a Canadian case of genocide as the backdrop to an examination of how a new generation of British Columbian artists, self-aware as inheritors of a colonial history, shift their posture vis-à-vis the landscape to which their identity is expected (Group of Seven, Emily Carr) to be anchored. With Seung-Young Kim’s Self-Portrait, we were introduced to a post-colonial Korean who through artistic projects has sought to constitute a new notion self. Kim’s has been a very personal journey whereby he has not only sought to bridge the tricky waters of the relationship between Korea and its former colonizer, Japan, but in an increasingly transnational world has found himself swimming against strong tides of racial prejudice to actualize a colour-blind approach to personal and social relationships. Exiled and non-exiled Persian cultural voices, that sense a loss of modernity from a perhaps unexpected angle, were the focus of the Nowruz Arts Festival and the exhibition of Mansouri Moslem’s The Final Word: A Film about Shamlou. Their loss is one of a historically rich and relatively free arts scene, characterized not by its reverence for Islam, but rather by its secular celebration and examination of the human experience. With Adrian Buitenhuis’ exhibitions of Woodfibre and Highway 99 we have watched a young local film-maker/artist contemplate memory and loss in the very specific context the Howe Sound region in transition. And with VERSITILE a photo exhibit that coincided with the opening of the Pinnacle Hotel, artist Marie Berg reminded the community of what the place looked like not so long ago. All of this was prefaced by We Love You Comrade Navin! an exhibition of the Navin Party. Navin Rawanchaikul and Tyler Russell’s ongoing collaboration, that, in an increasingly transnational and virtual world, looks at the diminishing role of State names and narratives in the constitution of human identities. ID in NV and its preceding exhibition history are particularly relevant as this community looks to re-envision the function of Lower Lonsdale’s Eastern Quarter, and in particular what has come to be known as the National Maritime Centre site. With visioning sessions and a flurry of proposals on the horizon, it is hoped that the past will be honoured and the present and future empowered, as one of Canada’s last sections of publicly owned, high-profile harborfront is slated for re-development. We are the inheritors of a rich, complex and contested history with a future cultural and material possibility not shared by many others. It is with these facts front of mind that we must move forward, and discover for ourselves whether or not there really is ID in NV and if it is something we can share through conversations with the rest of the world. Café for Contemporary Art, a 2010 Krups Kup of Excellence finalist and home to the North Shore’s only Clover makes room for art by providing the community with tasty homemade, soups, sandwiches and baked goods and exquisite coffee roasted by Vince Piccolo’s 49th Parallel Coffee Roasters. 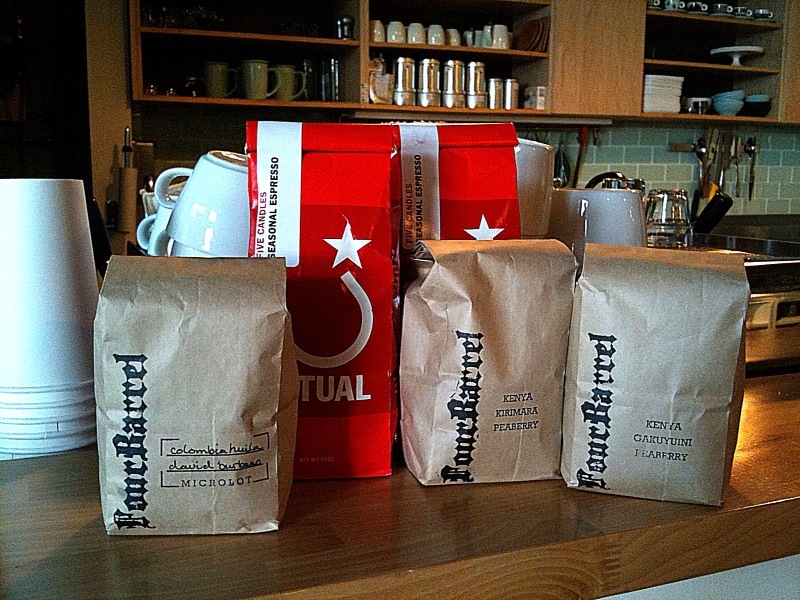 On the recommendation of a very nice barista at Wicked named Vivian, I picked up a bag of Intelligentsia’s Guatemala Finca La Soledad yesterday. I brewed it in a pourover this morning and WOW!! A very nice coffee. Oodles of body with notes of – it surprised me too – grilled fruit. I don’t know if you’ve ever grilled a nectarine, but it’s delicious – you should try it. That’s also what this coffee reminded me of! Delectable. I have some fantastic news for you! We have just received an amazing new Ethiopian coffee – the Sidamo Nekisse Micro Selection. The proceeds from this coffee are going to imagine1day, a local charity that will use the money to build a school in Ethiopia. The tagline: “coffee educates a nation”. This coffee comes from the Sidamo region of Ethiopia and is classified as a micro selection. That means it is a small portion of a micro lot, which is a small portion of one harvest. It is of exceptional quality and it is incredibly rare – 49th Parallel is the only roaster in Canada to have access to the green from this selection. This Wednesday June 2nd at 7:30pm, Ariel Barnes plays Sol Y Luna, a solo cello show here at Cafe for Contemporary Art. Ariel Barnes enjoys a diverse career as a soloist, chamber and orchestral musician. Over the past several years, he has performed to great acclaim in Canada, the United States, and Mexico. Equally comfortable in genres of music ranging from the baroque to modern times, his performances have included evenings of Mozart’s chamber music to contemporary solo cello recitals. As an avid chamber musician, he has enjoyed appearances at MusicFest Vancouver, the Ottawa Chamber Music Festival, Mendocino Music Festival, Music at Port Milford, and Northern Lights Music Festival. Along with colleagues Mary Sokol-Brown and Andrew Brown, Ariel is a member of Trio Accord, a Vancouver-based string trio which the Victoria Times praised for its “enchanting,” “exhilarating,” and “extremely moving” performances. Trio Accord have recently been return guests at the Northern Lights Music Festival in Ajijic, Mexico and are currently Faculty members at the Courtney Youth Music Camp in British Columbia. Released in the fall of 2008, Trio Accord’s debut recording on Skylark Records of J.S. Bach’s Goldberg Variations was nominated for Classical Record of the Year at the Western Canadian Music Awards. 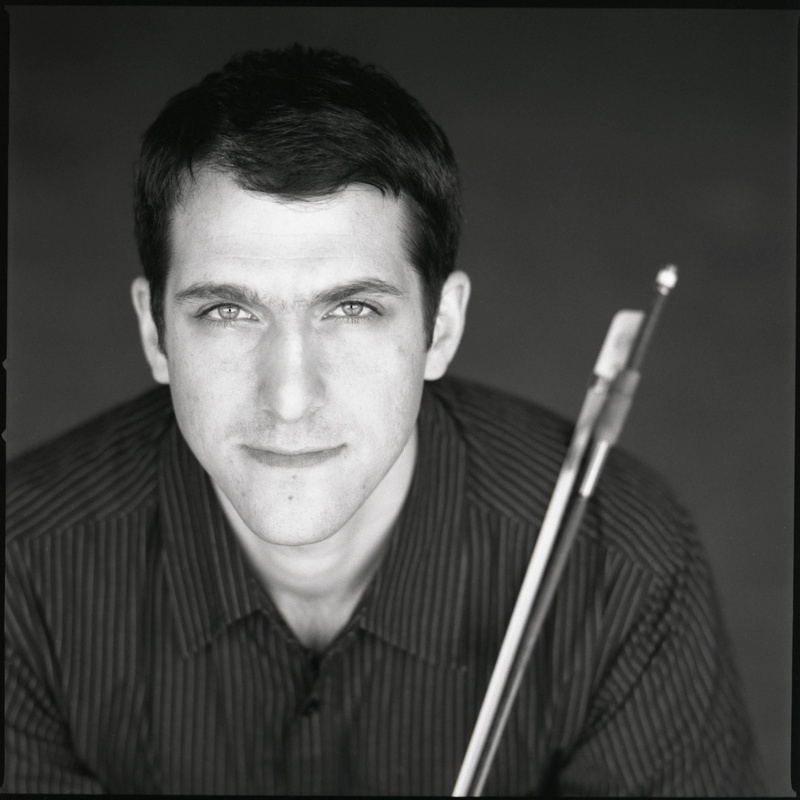 He is currently Principal Cello of the Vancouver Opera Orchestra, a member of The Turning Point Ensemble and National Broadcast Orchestra. Ariel’s recordings can be heard on ATMA Classique, Skylark Records, Universal Music, 604 Records, Centrediscs, CBC Radio (including Espace Musique), CBC Television, Integrity Music, Za Discs, Disney Films, and Funktopus Records. His principal teachers have included Daniel Domb at the University of Toronto, Bruce Uchimura at Western Michigan University, Craig Weaver of the Seattle Symphony, and Eric Wilson at the University of British Columbia. In addition, he has received coaching from Tsuyoshi Tsutsumi, Janos Starker, Lawrence Lesser, Lorand Fenyves, and members of the Guarneri, Cleveland, Orford, and St. Lawrence String Quartets. Tickets for this event will be available at the door for $20.00, and advance tickets will be available through Ariel. …come down and try some! Some of you may know that Cafe for Contemporary Art has a lot of merchandise for sale. 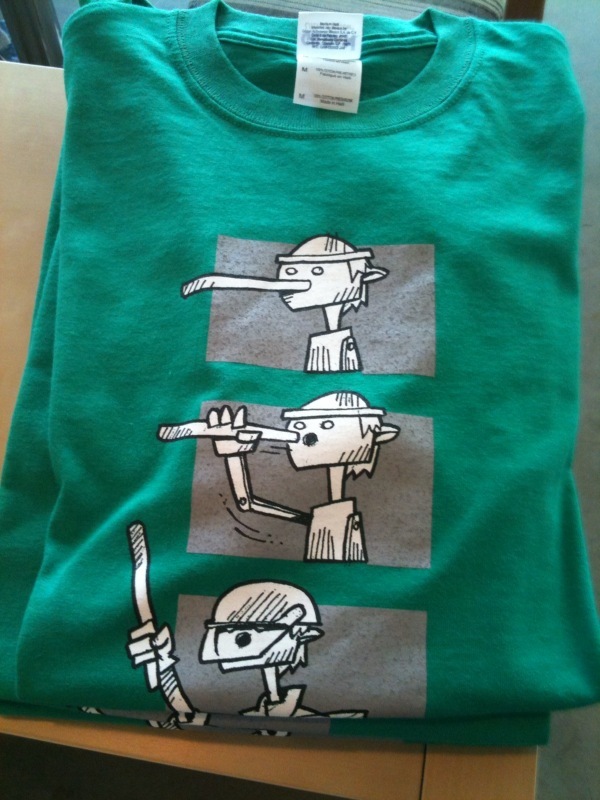 I would like to introduce you to some of t-shirts available at our cafe. The designs of Afshin Sabouki, Adrian Boston, and Carla Trevisi are all available at our cafe! 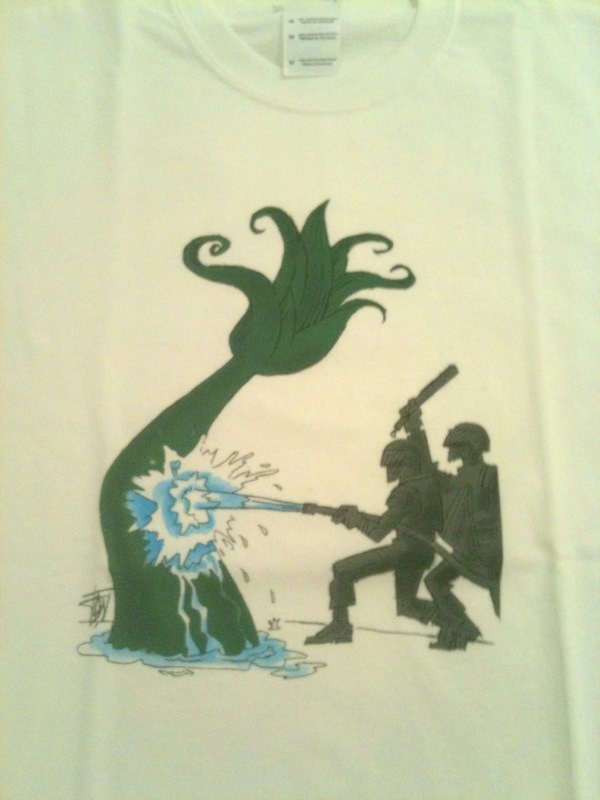 Afshin Sabouki’s designs were created last year as a reaction to the elections in Iran.